Anyway, the reason for this is the huge improvement to the workflow for scene editing and having a new and improved Attachment and Detachment system which allows you to drag and drop entities from the scene entity list onto other entities. This is not all though because now we can also drag entities onto bones in the entity list also which gives quick attachment of armour and weapons directly onto skeletal structures. Of course, all this works in the player and in the end game and you can also save presets with this information. Hooray! Skyline is finally moving on as this feature never existed in Gen1. Also, the entity list now has a right click c ontext menu which will be developed as time goes on, everything there so far should be functional par a couple bits. This is still being worked on so hang tight. Folders are also changed and now they use unique ids internally which means you can now have 2 folders of the same name and in different structures which will load back. Before if 2 folders were created, on load back the merged and the second was never added. Folders are also added from the right click and can be added directly into another folder rather than appearing at the bottom of the list and requiring draggings. It is all designed to fit the next stage of development also, where we will be introducing groups, sub mesh control and mesh optimization. While all this has been developed, we have also been working on a new crafting and survival game using skyline. A shot of it was shared on Discord, but i will post it here too. 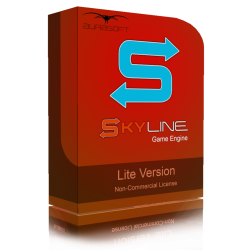 The changelog doesn't appear to be huge and that is because alot of the changes have been core to skyline and we have tried to keep the same workflows that you are all used to already, but the changes are pretty major in how skyline works and has affected the scene files, presets, and loading orders. Scenes when saved will now organise the entities into an efficient Parent > Child relationship to ensure the parent always exists before the child. Everything you have already saved and user should still work on this version, but resaving the scene or preset will save with the new data instead. New: Scene Entity List: Reworked folder system and how it is created, deleted and parented. New: Scene Entity List: Better parenting of entities with folders and duplicating entity will make it go in the same folder. New: Scene Entity List: You can now attach entities directly to entities and go as many chains down as you want. New: Scene Entity List: Scene serialiser now saves scene structure with the entities and can change what to attach by hashes. New: Scene Entity List: New Internal id system allows for attaching and detaching system to take place for entities, plus actions still work as a child entity. New: Scene Entity List: Deleing a folder will also delete all entities within. New: Sub material panel: when multiselected, the panel will change instead of spitting out the annoying print to console each time something is selected. New: Presets: Now they export and load Entity Attachment information back into the scene and generate fresh idents internally. New: Presets: Now they export and load Bone Attachment information back into the scene and generate fresh idents internally. New: End game: Now works with the Entity Attach. New: End game: Now works with the Bone Attach. New: Editor Player: Now works with the Entity Attach. New: Editor Player: Now works with the Bone Attach. Updated: GUI EDitor: Creating a new file took you tp the system library instead of the user library. Updated: GUI Editor: Pressing cancel on creating a new file, would create a duff file anyway. Now it just returns as it should. Updated: Gizmo: We have reworked all the selection and deselection modes so it works with the entities inside entities inside entities and so forth. Updated: Entities: All positions are stored with local position instead of world, so children know where they belong easily with parent entities. Updated: Entities: All rotations are stored with local position instead of world, so children know where they belong easily with parent entities. Updated: Entities: All scales are stored with local position instead of world, so children know where they belong easily with parent entities. Updated: Selection has a smoother workflow when clicking and unselecting an entity. Fixed: When loading skyline for the first time, if a library was created with double library in the name, then skyline could fail to load. Fixed: When adding more user libraries through the editor settings, if a path had the library name twice, it could fail to load skyline. 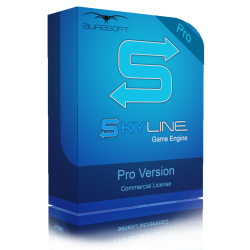 Fixed: Auto Updates: The Pro version of skyline failed to successfully update due to some left over studio pro lines in the update files. Fixed: Sometimes crashed when generating a material thumbnail. Fixed: Visual Modules did not show the custom graph module folder. Fixed: Binary Presets were not loading properly.